Apothecary Deluxe is a feast of shape and symmetry with a wavy chevron pattern creating ripples of color behind a framed arabesque-shaped white panel. The visual effect is striking but harmonious - drawing attention to center stage, where your text steals the show! Set in high-contrast black type, the fonts for Apothecary Deluxe have strong individual appeal and they look great in combination. The largest bold caps are subtly distressed, like turn-of-the-century wood type. A thick italic mirrors the subtle sway of the chevron pattern, a classic serif adds a touch of friendly formality and a retro all-caps font is printed at a slight slant in red ink, as though rubber-stamped by hand. Apothecary Deluxe is offered in a palette of 28 lavish colors: lights, darks, brights and neutrals - all ready to customize for your product, business or special event. 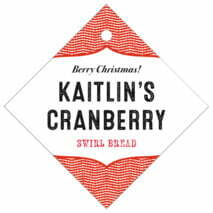 Customize your Apothecary Deluxe christmas gift tags today! 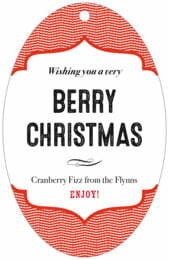 Apothecary Deluxe Christmas gift tags are printed on the front with holiday designs, and you can personalize them with your names and sometimes your photo. People like to tie the tag onto the ribbon or other decorative material used to embellish the gift. Tags are punched out and shipped in a small bag. 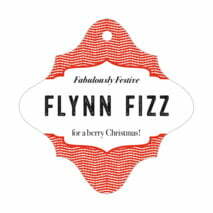 Make your gift giving a little easier, and a lot prettier, with Evermine gift tags. Choose your desired color and shape from above and then select the green "Personalize" button to start customizing your Apothecary Deluxe Christmas gift tags today!